The Tilt-Table is another instrument which allows physiologist to examine rapid changes in posture and its effects on the cardiovascular system, as well as cognition. The prinicpal is rather straightforward. While laying on the Tilt-Table, a subjects posture is rapidly shifted to either a vertical vector, or to a 6° head down tilt (HDT). This prinicple of this examination is to analyze on one hand, rapid fluid shifts during changes in posture. Another aspect concerns research into the mechanims of the baroreceptor system. The baroreceptor system is responsible for the maintenance of stable blood pressure. 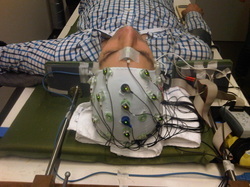 A further aspect of the Tilt-Table is to examine how human cognition responds to rapid changes in posture. The Tilt-Table also simulates rapis onsets/offsets of gravity, and has a very high relevance for clinical research regarding orthostatic instability.